I just finished creating a tutorial that shows how to implement custom drag and drop functionality on a Recycler View to enable both re-arranging items in the list, as well as dragging to Views outside the RecyclerView. Xamarin.Android provides the ability to implement a RecyclerView helper class to rearrange a list of items. 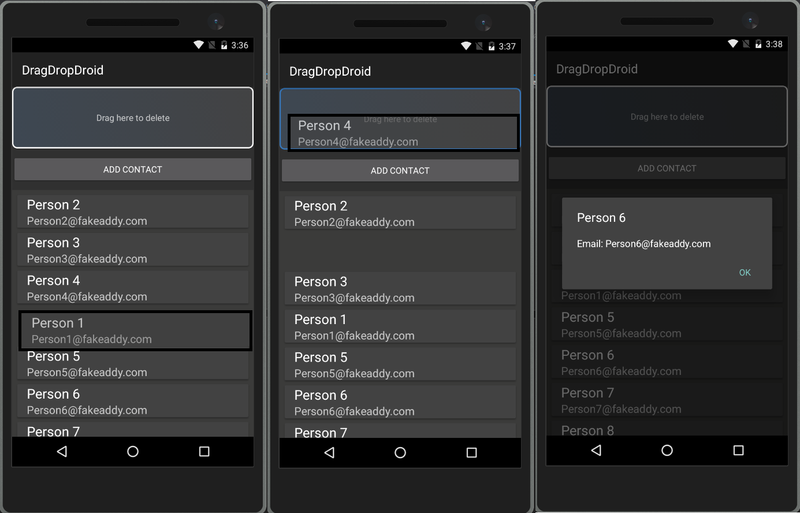 Additionally Xamarin.Android exposes a simple API to enable drag and drop between two View controls. Unfortunately, the RecyclerView helper class used to rearrange list items does not support dragging list items to controls outside of the RecyclerView control. To enable dragging list items from a RecyclerView to other views, will create a layout file that uses a CardView control to gain access to long-press methods, and implement custom drag events. These drag events will support rearranging items within the RecyclerView, and also allow the user to drag list items to another view to delete them. For the purposes of this demonstration, we will create a simple contact management application that allows a user to work with a list of existing Contact records, re-arrange and delete them by dragging to the appropriate area on the screen, tap on each contact to view the contact details, and simulate adding new contacts to the list. Creating the main Activity and customizing it to implement Drag and Drop functionality. At the end of this tutorial you will have a fully functional, custom RecyclerView drag and drop implementation that extends the RecyclerView's drop range to any view control. With the knowledge you gain from this tutorial, you can go on to implement more custom drag and drop functionality in your own solution. The source code for this tutorial series can be found on my GitHub page. Attached is a screenshot of the project in-action. Any chance you know or have a equivalent solution for Xamarin.Forms which works well on Android? I don't think there is a known implementation for Xamarin.Forms on Android yet. This one enables ListView Drag and Drop for iOS, but not Android. I may work on a Forms implementation next when I have some extra spare time. Thanks @ChristophKahl - Glad you found it useful!